You know what’s hard about having a newborn? Everything but being with him. Because I work from home, it’s difficult to get anything done when he’s not having a good day. And it just so happens that the witching hour (when he regularly becomes fussy) coincides with the hour or two before dinner time when I typically would be cooking. I’ve started quite a few meals, only to have them sitting half made on the stove when Brad comes home, while I dance around the kitchen with Elliott. So it’s no surprise that home-cooked meals have been few and far between lately. But this is one meal that I managed to cook in its entirety. Thank goodness, because half-made cold polenta just isn’t very good. This, on the other hand, was very good. 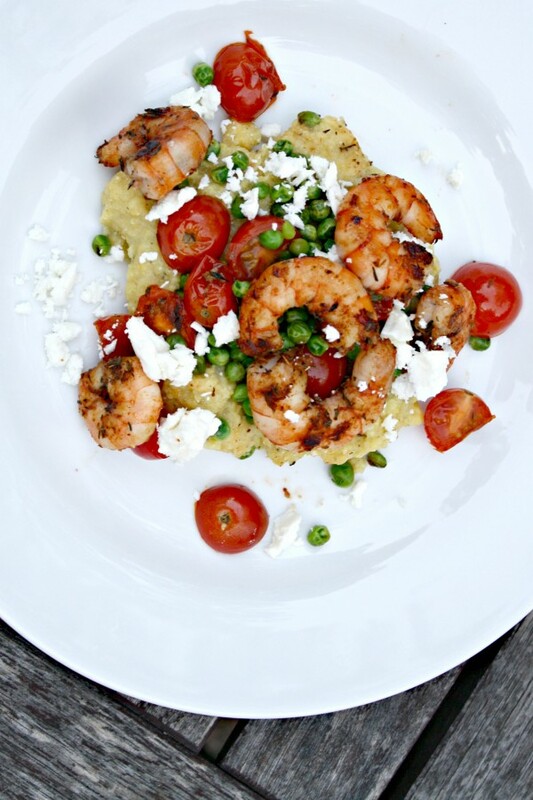 I love anything blackened and the spicy shrimp paired with the creamy polenta and the feta was so delicious. If you make this in the spring, you could make it with fresh peas, but frozen peas worked just fine in this case. Bring chicken broth to a boil in a covered medium sauce pan and add polenta. Cook for about 30 minutes or until broth is completely dissolved, stirring frequently. Season with thyme and salt, adding more salt to taste if necessary. Stir together the ingredients for the blackened seasoning. Heat the olive oil in a large pan on the stove top. Sprinkle shrimp on both sides with the blackened seasoning (use all the seasoning). Place shrimp in the pan and cook until just pink and opaque on both sides. Do not over cook. Remove shrimp from pan, place on a plate, and cover with aluminum foil to keep warm. Place peas and halved tomatoes in the pan. Add more olive oil if needed. Saute, stirring frequently for 2-3 minutes until tomatoes start to burst. 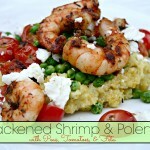 On each plate, place a quarter of each: polenta, peas and tomatoes, feta, and shrimp. Serve immediately. 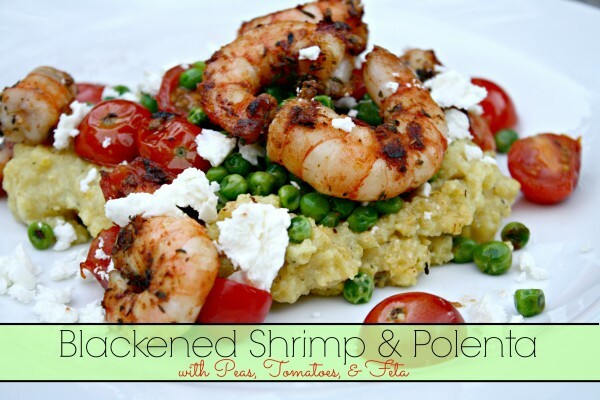 The only time I’ve ever made polenta was when I made your scallops and polenta dish (which I loved!) so I’ll definitely have to try this! Thanks!